I have 6 jpeg files that cause problems for Lightroom. They all have the following characteristics. 3) I cannot save metadata into these files using LR 3 for Macintosh. Upon Saving Metadata I get the exclamation point showing a metadata sync error. Lightroom says "There were unknown errors while writing metadata..."
The files were all written by a Minolta camera (that I no longer have), and have been modified by having tags added to them by exiftool (recent command line version, running on Macintosh). I have archived these files. If you would like to look at them, contact me and I can send them to you. The files are not causing problems for me, as I have opened them in Photoshop CS 5 and saved them as fresh copies, which cause no problems for Lightroom now. I have a similar problem on Windows. except that trying to write the metadata crashes the application. I do not know if we have the exact same problem, but mine is being looked at. The workaround I found is about the same as yours : edit and save the metadata with an other software solves the problem in lightroom. 1) I can't write keywords to these files in Bridge CS 5. However for one of the files I get the error "Warning: [minor] Can't handle XMP attribute 'rdf:ID'", and I need to use the "-m" flag (ignore minor errors), after which I can write the tag. After writing the new keywords in exiftool, Lightroom will see the new values (after a Read Metadata), but still can't write the metadata. So whatever the problem is, exiftool has no problem with these files (read or write), but Lightroom still can't write to them. And, obviously, the files are not locked, and permissions on them look normal (644). Alan, I'd like to get a few of the problematic files so we can look at this closer. I'll contact you privately for them. I am also having problems on Mac (v 10.6.8) similar to what Alan describes. My photos are captured with a Nikon D50. I am a new Lightroom user and loaded my most recent pictures directly into Lightroom to test before transferring all my photos into Lightroom. I set catalog settings to automatically write changes into XMP, set Lightroom to back up each time I exit, and set camera RAW cache to 50 GB. All other settings I left as default. Pictures were copied into the catalog as jpeg from my camera card. I tagged and added captions or titles to numerous pictures. 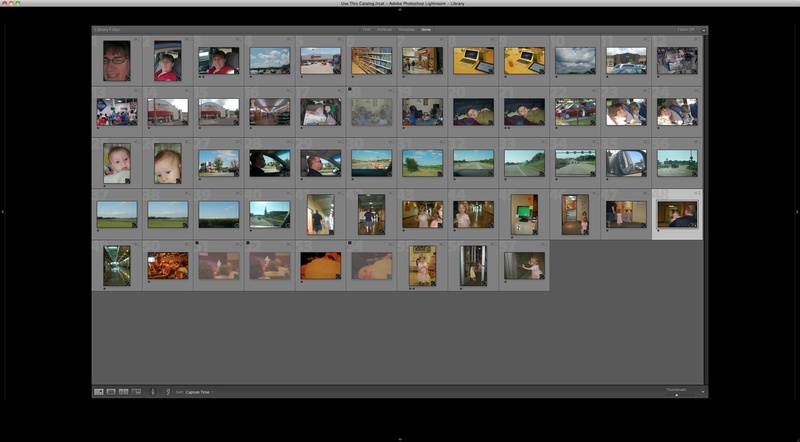 Today when I opened Lightroom, some pictures had the exclamation point and some didn't. When I tried to resolve the mismatching sidecars within Lightroom, the program would go through the motions of exporting the metadata, yet when I checked the actual file that the catalog is linked to, the metadata was not included in the information for the image. The exclamation badge still showed in the catalog also. In comparing the info for files where the metadata wrote and those which didn't, I noticed that the permissions are different. (I will include a screen shot). I changed the permissions of the non-written files to match the written files and tried to resynchronize with no luck. I'm not sure what else to do to make the catalog write the metadata to my picture files. Is there something I'm doing wrong? I have not tried editing the photos in Photoshop yet. Eventually I will be pulling them in to make scrapbook pages. Christine, I note that the create date and the modify date are the same for each of the files that you posted. This suggests to me that Lightroom isn't writing metadata to either file. I use the modify date to see if LR is making changes that i expect it to make. I doubt that permissions are the issue, as I think that the permissions for either file shown are sufficient to allow LR to edit the file. Perhaps the permissions differ because you downloaded the photos to your camera in different ways? Perhaps LR was having a problem writhing metadata to the jpegs, like I found, but I doubt it, as your Nikon is a common camera. That said, I don't have any good ideas as to why you would be having this problem. You can trouble shoot some of the issues by (a) opening and saving a copy of the files in Photoshop. This rewrites the jpegs completely, and should wash out any issues with LR not being able to process the jpegs (this was my problem). But if you are really having problems with all your camera's jpegs, perhaps you should try (b) creating a new user on your computer, and downloading photos from your camera as that user. If that solves your problems, look to an issue with a preference file as a possible source. The photos were downloaded all from the camera, imported to Lightroom and modified all on the same day. That is probably why the create and modify dates are the same. I did try opening a couple of the affected photos in Photoshop and re-saving them as jpegs, overwriting the original file. Then, I went back to Lightroom and clicked the exclamation point to overwrite metadata. That worked. However, this is going to be really annoying if I have to do this every time I download pictures from my camera. At least Photoshop has actions that can help me clean this up fairly quickly. Nevermind about the dates. I see what you mean by the create and modify date being the same. I tried creating a new catalog on my laptop (different computer) and imported some brand new pictures. I wiped my laptop clean when I upgraded to Lion, but I'm still having the issues I described above. Could my camera be writing jpegs to the memory card in a way that is not allowing LR to write the metadata properly? I am still a very new user of Lightroom, and I have exhausted my ideas. Hopefully someone more knowledgeable will comment. If not, try reposting the question under a new heading. Sorry I can't do more. My current catalog has over 2500 jpg files with this problem... and this is just the files I have touched and there are likely to be more in my catalog that may have this issue but are untouched. I have used a number of tools to manage my pictures in the past before LR. But other EXIF viewers don't seem to see anything wrong with the metadata in the files. I'd like to look at a sample file that demonstrates the problem. I'll contact you privately. Thanks for the sample file. I am able to reproduce this problem using your file, and have entered the issue in our bug database. So is there any solution coming out of this? "The XMP is bad because some app wrote a form of RDF that is legit in general RDF but long documented as not allowed in XMP. The Exif Software tag says "f-spot version 0.5.0.3". This is a photo app in GNOME." So, if you are experiencing a problem saving metadata to files from Lightroom, it's a different problem than the original issue reported in this thread. Is it possible that this is the issue that you're experiencing? If not, can you provide more information, and ideally an example file that demonstrates the problem? The issue originally reported by Alan has been fixed in Lightroom 4.2. I don't think my problem is related to the linked topic, as my issue is not new since 4.2. I'd hovered around this thread from 4.0 as it seemed to describe my issue exactly. I can send you a jpg that exhibits the problem, although I will also point out that this problem seems to extend to any jpgs regardless of source (i.e. I have the same problem with direct jpg output from several cameras, as well as with jpgs that were exported from and re-imported to lightroom based on the raw files). How should I pass along a sample file? The easiest thing is probably for you to upload the file to dropbox.com or yousendit.com or a similar service, and then post a link here. Other than a few very narrowly defined circumstances, saving metadata to JPEGs works fine in my testing, so it will be helpful to look at one of your files. Can you provide more info about what behavior you're seeing exactly? Are you getting the same error message that Alan originally posted, "There were unknown errors while writing metadata..." or are you seeing something else? My issue is slightly different: no error messages appear, and the metadata appears to save initially. But then after 10-15 seconds, the files begin showing that the metadata needs saving again. This doesn't happen with any of my DNG files. I haven't tried other file types. 1. Select just the photo you sent me (or any other photo which exhibits the same problem). 2. Export just that single photo as a catalog (include negatives). 3. Open that single-photo catalog on your own system to make sure that the problem still reproduces. 4. Send me the catalog and the photo. Any thoughts Ben? I also have the problem with at least 1 tif file too. Thanks for the poke, somehow I missed your post from three weeks ago. I am able to reproduce the problem using your catalog, and I've entered the issue in our bug database.